GARRET MEADE PHOTO | McGann-Mercy football coach Jeff Doroski faces an uncertain future amid speculation that he will be replaced as the team’s varsity coach. Word began to spread Wednesday evening among parents and players of the Bishop McGann-Mercy football program that popular varsity coach Jeff Doroski has been fired, the News-Review has learned. Reached for comment late Wednesday, Mr. Doroski declined to speak with the News-Review. Calls and emails to Mercy athletic director Paul Mastronardi and principal Carl Semmler were not immediately returned Thursday to confirm. Mr. Mastronardi just became athletic director this month, replacing John Lonardo, who resigned to pursue a business opportunity in the private sector, school officials have said. 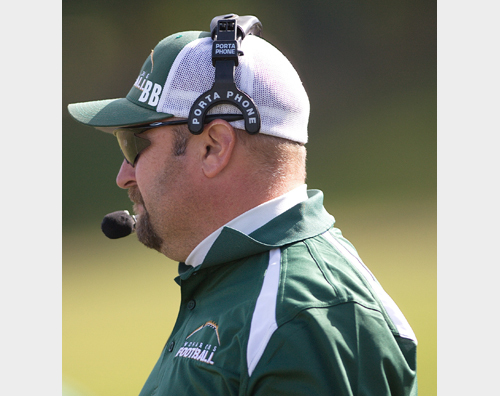 Mr. Mastronardi has been a longtime football coach himself, most recently at Eastport-South Manor last fall. It’s unclear whether Mr. Mastronardi would be in line to replace Mr. Doroski, who has been the varsity coach for the past three seasons. A 1992 Mercy graduate and physical education teacher at the school, Mr. Doroski posted an 11-15 record in his three seasons, highlighted by a trip to the Division IV semifinals in 2012. The Monarchs’ 7 wins in 2012 matched the football program’s highest single-season total since 1978. The Monarchs team also won its first playoff game since 1991, a 22-21 thriller over Hampton Bays. The Monarchs struggled last season amid injuries and a more difficult schedule that resulted from the strong 2012 season. Mercy dropped its first seven games before winning via forfeit against Southampton in the regular season finale. Mercy football players have been vocal on social media in opposition to the alleged firing. On Thursday, football players arrived at school with shirts featuring “Doroski” taped across the back, according to a student. Mr. Doroski’s ties to the Mercy community run deep. His parents both attended the Riverhead Catholic school, as did his wife. In 2003 he coached the varsity baseball team to a state championship, the only state title in school history. Most recently he coached the junior varsity baseball team this past spring. Mr. Doroski once held the athletic director position at Mercy shortly after returning to the school following college. His previous coaching experience included stints with Riverhead, Longwood and Shoreham-Wading River. In 2011, Mr. Doroski replaced Joe Read as varsity coach. Mr. Read had been the coach for four years, compiling a 10-23 record. Mr. Read coached as an assistant at Eastport last season under Mr. Mastronardi. Mr. Mastronardi was once hired to coach the Riverhead varsity football team, but resigned before the season ever started. He was hired as Blue Waves head coach in February 1997 and resigned two months later amid backlash from the community, which favored the hiring of another coach. At the time, Mr. Mastronardi was a New York City firefighter. Parents at the time felt he couldn’t do both jobs. Mr. Mastronardi coached at South Side High School from 2010-11 and the school opted not to bring him back after two seasons. His resume included coaching experience at the college level at Villanova, St. John’s and Stony Brook, according to Mercy.